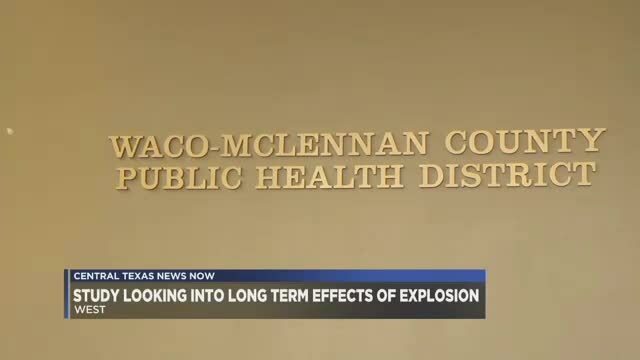 WEST, TEXAS — The Waco-McLennan County Public Health District is researching the mental and physical long-term health effects of the West Explosion on April 17, 2013. The explosion killed 15 people, injured hundreds and destroyed hundreds of buildings. The department plans to launch an online survey and conduct in-person interviews with West residents. "We may be looking at increase in anxiety if there are any changes in behavior in children. If there are any post-traumatic stress syndromes [and] if the cases of depression have increased," Waco-McLennan County Public Health District Senior Vaidehi Shah said. They also plan to look at chronic conditions, such as heart disease and respiratory problems. "It will help us plan interventions, which will help the community," Shah said. West Mayor Tommy Muska who shared he developed PTSD after the explosion said he thinks the results will be beneficial. Muska initially acted in the capacity of first responder the night of the explosion. "I know that I suffer from [PTSD] and have symptoms of that illness. It's from the trauma of going through it and a lot of people probably do that haven't gotten tested. That's what the survey is going to show and enlighten some people," Muska said. West Volunteer Fire Department Assistant Chief Kirk Wines said the disaster changed everyone, including himself. “I’m a whole more emotional than I used to be. I don’t control my emotions very well,” Wines said. He remembers witnessing the explosion as he was approaching the scene. "When I got out of my pick up, it was still burning. I could see the guys up here. I started running toward the scene, it blew up before I got there," Wines said. The owner of the Old Corner Drug Store recalls helping firefighters in the aftermath of the blast. "We mourn their loss all the time. We miss them at the fire station," Wines said. The health district did a similar study in the aftermath of the explosion, in which they researched the injuries sustained and health resources used back then. They also looked into ways of improving their response.